Set on the sprawling, manicured grounds of Diamond Creek Golf Club, an unassuming wood building holds a stunning chamber of rough-hewn paneling and beams that reach to the vaulted ceiling. Here, chandeliers and candlelight cast a soft glow on the spacious room full of rustic tables and luxurious banquettes. Banner Elk’s Artisanal is the proverbial pot of gold at the end of the rainbow—the restaurant of a chef who has cooked in some of the country’s most lauded dining venues. Quality is a hallmark of the menu, which regularly features wagyu beef and locally grown vegetables. The chef’s able team creates all the tender pastas, breads, and desserts from scratch. Fresh catches are flown in regularly from Hawaii and Alaska. A dish that embodies the top standards is the veal blanquette. Though typically prepared with less tender cuts of meat, Greene’s version incorporates the finest tenderloin, bathed in a light, creamy shallot-tarragon sherry sauce that rivals any offered at a Michelin-star restaurant. A surprise of pink Georgia shrimp and French horn mushrooms, accompanied by mixed seasonal vegetables, round out this dish. 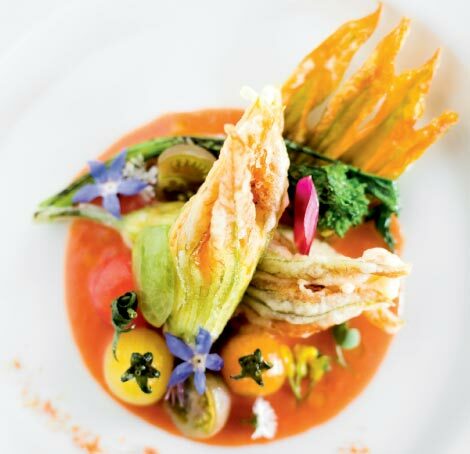 The menu is reinvented each week, but some inspirational ingredients, such as the squash blossoms, make repeat appearances. Greene may stuff the delicate blooms with seafood mousse or fragrant herbed goat cheese. The crunch of the gently flash-fried petals reveals a soft and warm interior. The house-made fruit sorbets burst with seasonal intensity, providing a bright end to a meal that is balanced with finesse and elegant flourishes, and whose memory lingers like the fading trails of a rainbow.